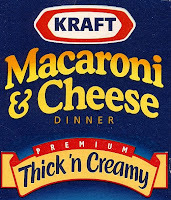 And while I'm on the subject of Kraft...Sometimes the labeling of their various brands of mac and cheese really makes me wonder. I'm not exactly sure what to make of "premium thick 'n creamy." How about you? 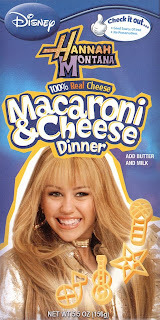 As if boxed mac and cheese wasn't disgusting enough already. I'm so sick of seeing her. And it's nothing against her as a person... she's just a puppet, I get that. Also, they lie about the creamy part. Even when you dissolve the cheese in more milk and butter than the box calls for before adding the macaroni back in the pot, there's still a powdery thing going on in the background. These aren't as bad as the gummi microphones and guitars. Have you seen those?